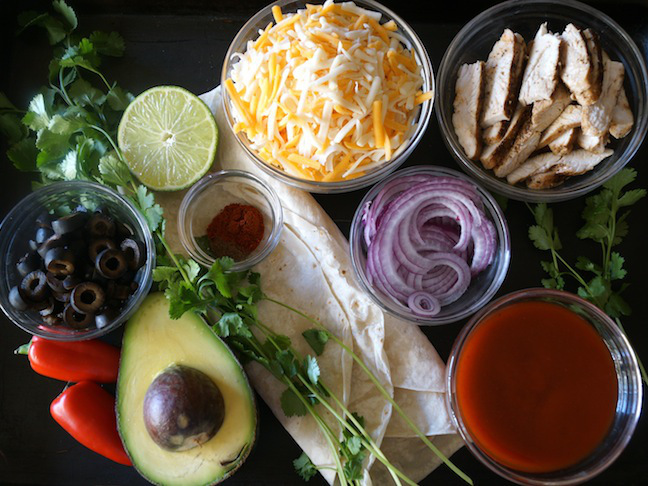 At my house it’s no easy task to make something for dinner that’s healthy, satisfying, and that all four of us love. When I do hit upon those recipes, it’s like striking the jackpot. 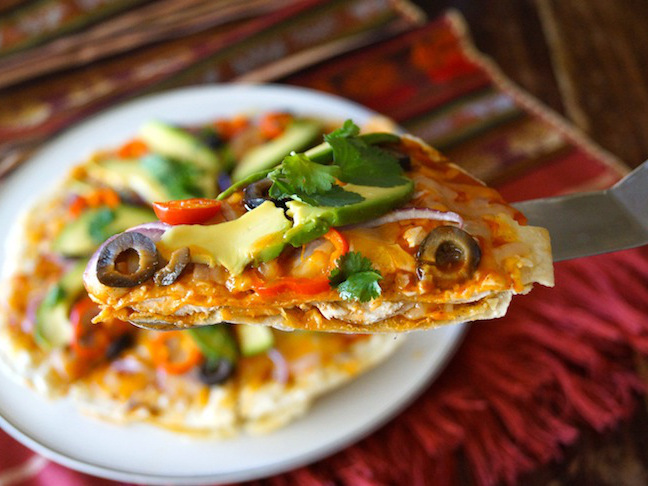 I consider this delicious loaded Mexican pizza the jackpot of all dinners. 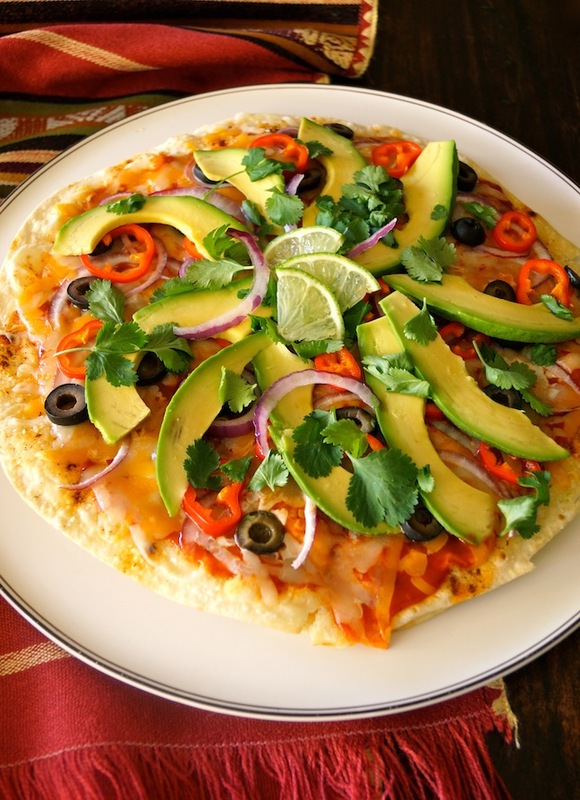 When I served this a couple of nights ago, my two boys were super excited when I told them dinner was going to be a combination of a taco and a pizza—two of their favorite meals. 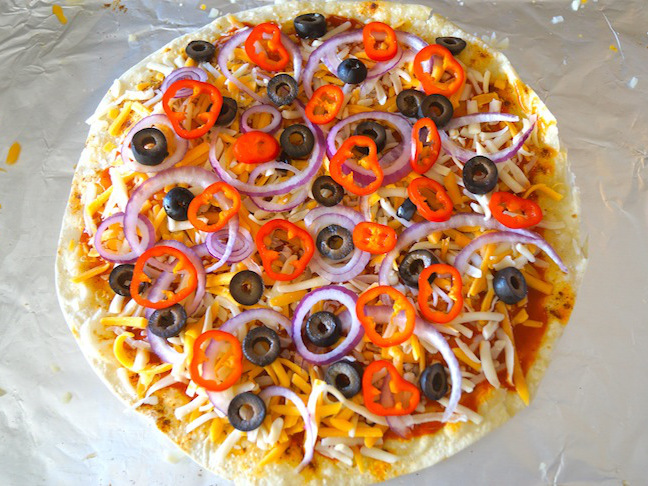 Loaded with nutritious ingredients that just happen to be my kids’ favorites, this pizza is also quick and easy, making it ideal for busy school nights. While I’ve tailored this to what my family loves, feel free to switch things out for your own favorites. If you prefer beef to chicken, use it. If you like tomatoes better than bell peppers, use them. I think you get it. Enjoy! 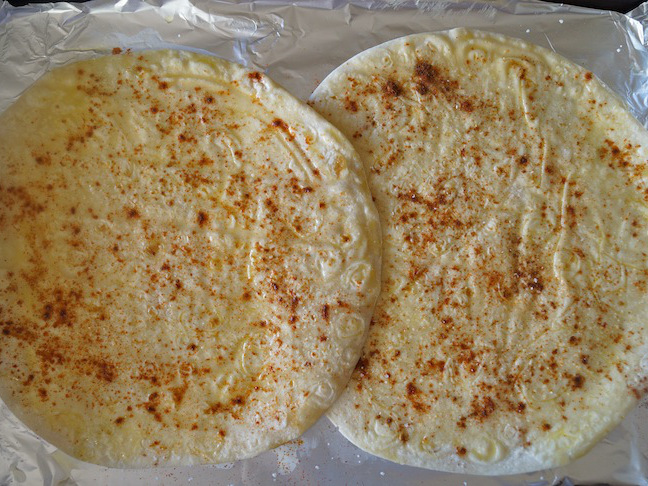 Step 1: Preheat the oven to 375 degrees F, and place both tortillas on a large baking sheet. (It's okay if they overlap a bit.) Drizzle about 1 teaspoon of olive oil over each tortilla, and use the bottom of a spoon or a pastry brush to spread it around. Sprinkle each one with about ⅛ teaspoon of the chili powder and cumin, and a bit of salt and pepper. Step 2: While the oven is preheating, coat the bottom of a small sauté pan with the remaining teaspoon of olive oil (and a bit more if necessary to cover the pan). Place the pan over medium-high heat. On a clean, dry surface, sprinkle both sides of the chicken breast with salt and pepper. Place the chicken in the pan once it's hot, and sauté until it's cooked through, about 7 minutes. It should be flipped over in the middle of the cooking process. Remove the chicken from the pan and set it aside to cool. 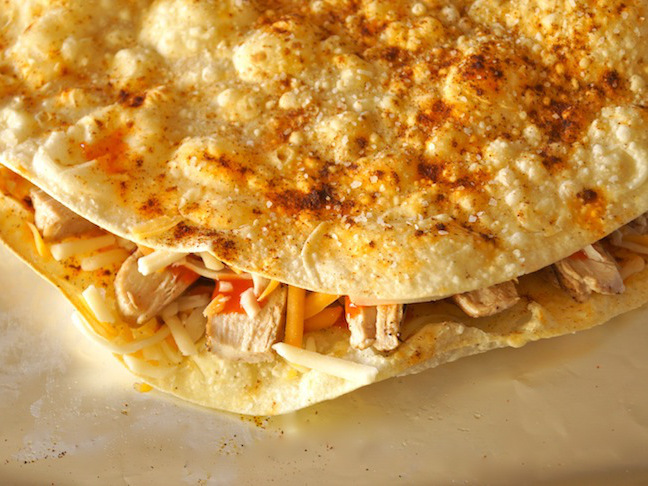 Step 3: Once the oven is preheated to 375 degrees F, place the baking sheet inside and bake until the tortillas bubble up a bit and are beginning to crisp, about 5 minutes. Step 4: Drizzle about 2 tablespoons of the enchilada sauce over one of the tortillas. 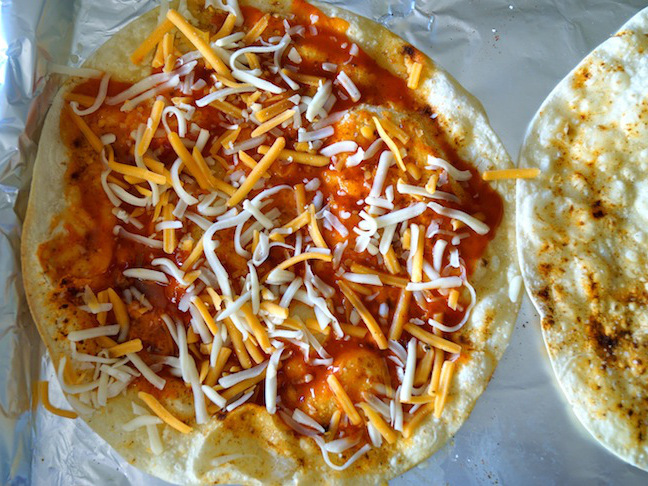 Use the back of a teaspoon to spread it around, and then sprinkle about ¼ cup of the cheese on top. 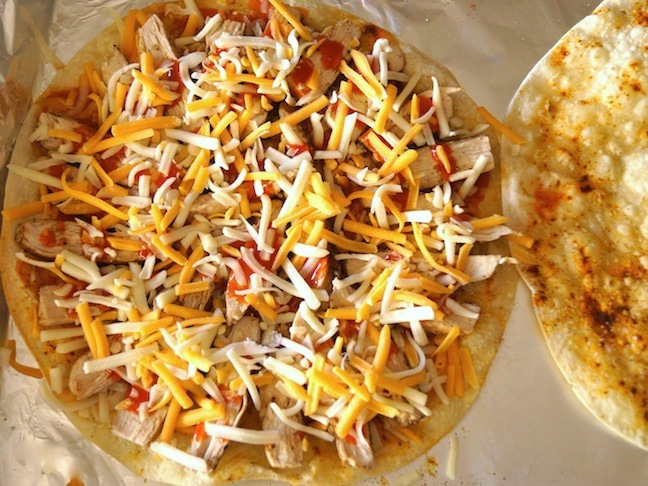 Step 5: Thinly slice the cooked chicken, and add it to the pizza in a single layer on top of the cheese. 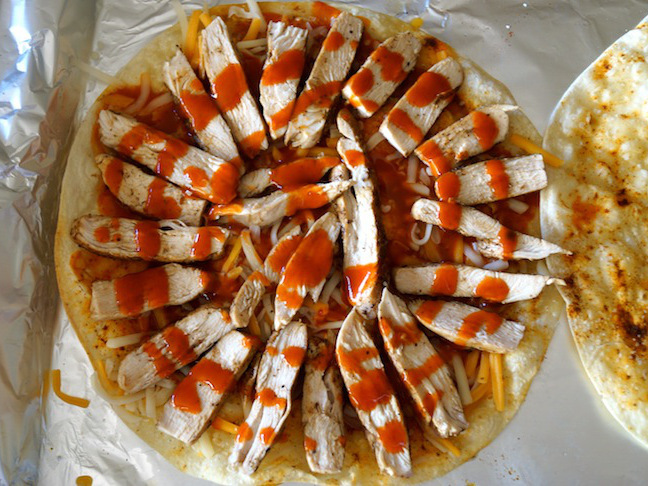 Drizzle the chicken with another 2 tablespoons of the enchilada sauce. Step 6: Sprinkle with another ¼ cup of the cheese. Step 7: Place the second tortilla on top. Step 8: Evenly drizzle and then spread the remaining enchilada sauce on top, followed by the remaining cheese, onion, red pepper, and olives. Step 9: Place the baking sheet back in the oven and bake just long enough to warm the ingredients and melt the cheese, about 5 minutes. 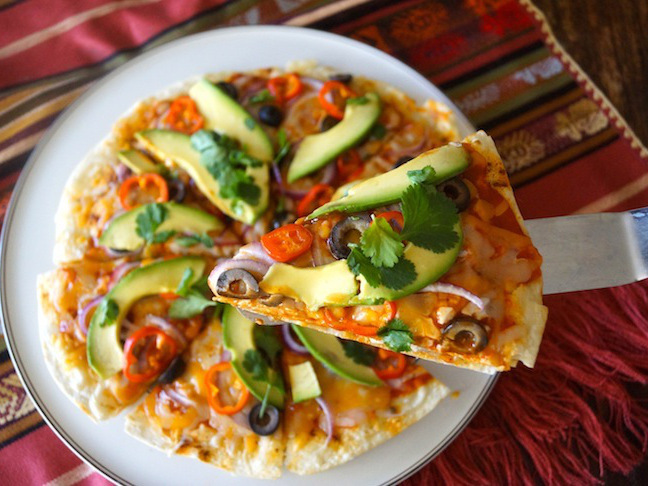 Step 10: Add the avocado slices and cilantro, and then sprinkle the entire pizza with the lime juice. Cut into 8 slices and serve.